Roll into Spring with a new dessert in West Lafayette, IN. 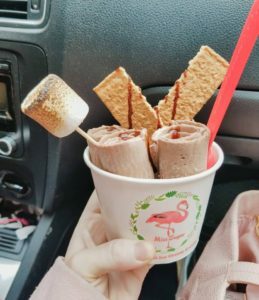 Thai “rolled” (also known as “fried”) ice cream is a fun, new way of answering your sweet tooth’s craving. 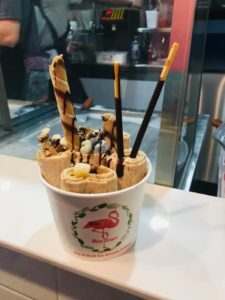 What is Thai Rolled Ice Cream? Here’s how it works: a staff member pours a base liquid onto a freezing cold flat top. How cold? Some are down to -20 degrees Fahrenheit. The base liquid consists of cream, sugar, and whatever flavor you choose. Once the base layer lands on the flat top, it begins to freeze into a creamy texture. The staff member continues to manipulate it, making sure it freezes evenly, eventually spreading it super-thin across the flat area. Then comes the exciting part- the staff member pushes and scrapes columns of the ice cream forward, creating multiple rolls of ice cream. 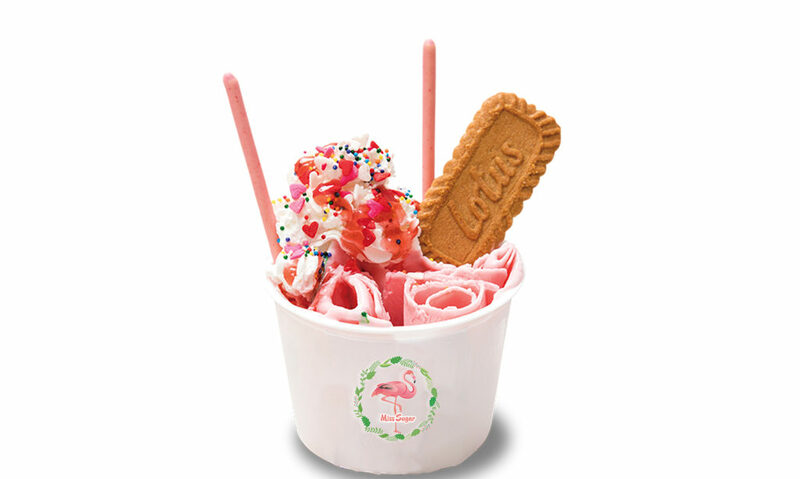 The ice cream then gets placed vertically in a cup and covered with your chosen toppings! We recommend that you step outside of your ice cream comfort zone and try this. It’s an amazing experience! Miss Sugar offers 13 different base liquid options! All are made fresh daily. There are simple flavors such as coconut, vanilla, and strawberry, but there are also some more exotic flavors such a Thai tea, Taro, and Red Bean. Click here to view a menu! Topping include cheesecake, boba, red bean, gummie bears, strawberries, whitpped cream, poki sticks, and more. There is a wide variety of flavor combinations available at Miss Sugar. Then the syrup options are: chocolate, caramel, condensed milk (what?! ), or strawberry! Other menu items include, fresh brewed tea (including Bubble tea!) and other specialty drinks, macaroons, and cakes! The cakes just need a 24 hour notice for an order, and a local pastry chef makes them! Yum! Enjoy Miss Sugar for your next family outing, date night, or special sweet treat. Friday & Saturday: 11:00 A.M – 10:30 P.M.
You can find helpful reviews on Yelp! Consider leaving this new business a review for others in the future!